Map of the Island of Cyprus. Large cartouche to bottom right hand side. An early fine example from Blaeu's 'Theatrum Orbis Terranum'. 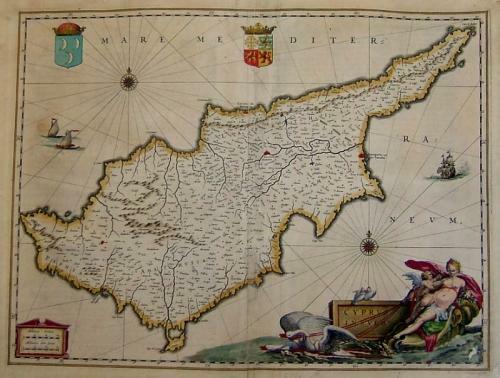 A superb map of the Island of Cyprus, geographically based on the earlier work of Ortelius. Many of its decorative features were copied by other cartographers. Two coats of arms; at centre the arms of the House of the Lusignans, and at left the Turkish arms. The map is beautifully arrayed with compass roses, sailing ships, and rhumb lines. The large cartouche bottom right shows Leda being drawn across the sea in a seashell chariot being pulled by a pair of swans, while Cupid pierces her heart with an arrow. The map is in fair condition having been rebacked. There are several small areas of paper loss in the margins that should not hinder framing.